Gigantic machines propelled by steam, gentlemen with top-hats and monocles, ladies wearing crinolines and parasols… the steampunk aesthetic never ceased to captivate since its creation in the 80’s. But what are its origins ? What are the major books, movies and comics? 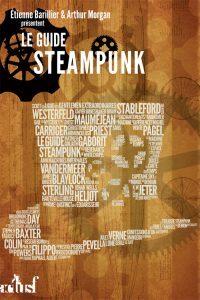 Written by Étienne Barillier, undisputed specialist of the genre, and Arthur Morgan, co-founder of the French Steampunk community, this guide paints an accurate vision of today’s steampunk with interviews of Tim Powers, K.W, K. W. Jeter, James Blaylock, or Greg Broadmore.